Also known as: Cos, Roman lettuce, Manchester lettuce. Romaine is the American term for this long leaved lettuce, also called cos or cos lettuce (mainly with British-speaking peoples) because it is said to have originated on the Greek island of Cos (Kos), off the coast of Turkey in the Aegean Sea (also the birthplace of the physician Hippocrates). It's original home is western Europe and the eastern Mediterranean area. Romaine has been cultivated and eaten cooked or raw for almost 5,000 years and may very well be the oldest form of cultivated lettuce. Egyptian tombs reveal paintings of lettuce with long, pointed leaves, resembling romaine. It was known to the Romans, who usually ate lettuce cooked, as Cappadocian lettuce, and was called Roman lettuce due to the Romans belief in its healthful and healing properties. According to Pliny, the emperor Augustus Caesar is said to have put up a statue to honor its healing abilities after being cured of a serious illness. A white latex oozes from its leaf base and the thicker ribs of older, larger leaves and is reflected in the first syllable of its Latin name, Lactuca, which means milk. Lettuce juice was used as a medicine by many ancient herbalists. Supposedly in the 14th century when the Popes of the Roman Catholic Church temporarily moved from Rome to Avignon, they brought this variety of lettuce with them, calling it Avignon lettuce. 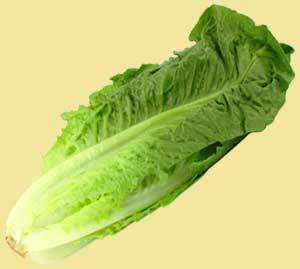 The earliest English name for it was Roman lettuce, around the 17th century. The source of the English romaine is from the French laitue romaine, Italians call it lattuga romana. In commercial terms, romaine is the second most important type of lettuce, iceberg lettuce being the first. See the recipes under Caesar Salad for the ultimate use of this popular lettuce. Appropriately invented by a man named Caesar! Romaine is a member of the daisy family Compositae which, although the second largest family of flowering plants, contributes only a few food plants (including also chicory, endive, escarole and dandelion). It is a cultivar of the common lettuce (Lactuca sativa) and is distinguished by an elongated head; dark green, long, narrow, crisp, stiff leaves and a coarse texture, with a distinctive rib almost to the tip of the leaf. These thick ribs, especially on the older outer leaves, have a milky fluid which is unpleasant, so they should not be used, nor should the leaf-tips, which can be bitter. (Although actually, these dark green outer leaves are the most nutritious). The interior leaves are paler in color, and more delicate in flavor. There is also a milder tasting variety with red tipped leaves and, a sweet romaine, which is even sweeter than regular romaine. Romaine lettuce matures in 70 to 75 days. It is slower to bolt (go to seed) than other varieties of lettuce, and also ships fairly well. Most of the romaine consumed in the United States is grown in Florida. Other important sources are California, Arizona and Canada, and of course local growers in warm weather. It is available year-round. The most popular cultivars are 'Paris Island Cos" and 'Valmaine'. Romaine grown in the open have a much better flavor than those grown in hothouses. Usually packed 2 - 3 dozen per case. Average yield 65%. Avoid heads with any signs of rust; avoid oversized butts; avoid older plants with large, strong milky ribs. Choose heads that are cut close to leaf stems and are free from decay and browning. Store romaine as for any other lettuce. The ideal temperature should be 33º - 35ºF. Do not allow the temperature to go below 32ºF., as this will damage the leaves. By the case, be sure to keep box tops closed. The waxed cardboard helps keep in the moisture. At home, store the unwashed, whole heads in plastic bags to retain natural moisture, and keep crisper. Uncut, whole heads of lettuce retain nutrients best. Surface water from washing encourages bacterial growth. Romaine will keep for 7 to 10 days this way. Keep away from apples, as ethylene gas they give off will turn the romaine brown. Like all lettuces romaine has a vary high water content and very few calories (about 10 calories per cup). Generally, the darker the green, the more vitamins and minerals (beta-carotene, calcium and iron, etc.) So it should be no surprise that romaine is the most nutritious of all lettuces. Romaine is an excellent source of vitamin C (more than 5 times that of iceberg lettuce).